These are the three running back progression drills we did at our international youth football camp last month. These drills are very easy to execute and they focus on the core fundamentals. These progression drills can be done every single time you break into individual position periods. Ball security should be the number one priority of a running back. We tell our kids that if you can’t hold onto the football you won’t be carrying the football very much. Ball security is something that many youth football coaches do not practice enough. Securing the football should be something that is worked on every single practice. Put the running backs into 3 lines. The first 3 have the football and the coach makes sure they are holding it securely. Then on the whistle the RBs run 10 yards, touch the line line (with hand not holding the ball) then coming back and give the ball to the next players in the line. After they go, they get into the back of the line. Every player should go at least two times. If you don’t have a lot of running backs you can just line them all up across in one line. Ball high and tight. Tip of the ball up. Eagle claw the ball against chests and bicep. On the whistle kids run 10 yards touch the line and run back to the beginning. while holding the ball properly. This drill is a full speed sprint. This an excellent drill that works several different techniques. This drill works on taking a handoff, developing agility, and they learn how to make moves in space (juke). You will need an agility ladder and a line mat. However, cones could be used as well. You will need an agility ladder, line mat, several footballs, and a cone. If you do not a have line mat you can use cones. The running backs line up in one line and once the RB gets to the first agility box the next one goes. If you don’t have QB (to handoff), have a coach handoff. I would also recommend going on a your snap count, rather than just a whistle. QB hands off to the running back, the running back puts each foot into the box holding the ball high and tight. Once the running back gets through the ladder, he runs at a cone and makes a juke move either right or left. This is a full speed drill. This is the ultimate running back drill. This drill practices ball security, agility, and how to lower pad level. 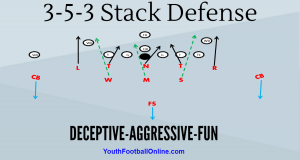 The kids will love this drill and it is something that you should do ever practice with your running backs. This is a great drill because it works multiple techniques at once, this will save practice time and make your practice much more productive. You will need one football and an agility ladder. All the players line up in two lines at the end of the agility ladder. Once the running back gets through the agility ladder he then runs through the tunnel of players that will try to stripe the football. Once the player goes, he then goes to end of the tunnel. Running backs need to keep the ball high and tight at all times. Running backs need quick feet through the agility ladder box. Running backs need to run through the tunnel with love pad level and with two hands on the football. It’s important that the running backs do not stop their feet, run through the arm hacking at the football. The kids love this running back ball security drill. This is an excellent drill because it teaches multiple techniques. 1️⃣ Works ball security. 2️⃣ Conditions the athletes. 3️⃣ Teaches the kids how to lower their shoulder and deliver the blow.